Having failed since 2009 to make the driver adjustable front wing a tool for overtaking, the driver adjustable rear wing flap has replaced the adjustable front flap for 2011. Known within the sport as DRS, for Drag Reduction System, this is now a proven way to allow overtaking. Within a set of complex sporting rules, the rear wing flap can be pivoted to reduce its angle of attack (AoA). This reduces downforce and drag, allowing the car to go some +10kph faster. This effect is similar to the F-duct stalling rear wings raced last year. Although the DRS effect on top speed is even greater than the F-duct. In theory the larger the flap the more drag can be shed when its activated, however the rules set out certain geometry the flap needs to operate within. Firstly the flap has to pivot within 20mm of its trailing edge, thus the flap must move upwards, lifting its leading edge clear of the main plane of the rear wing. 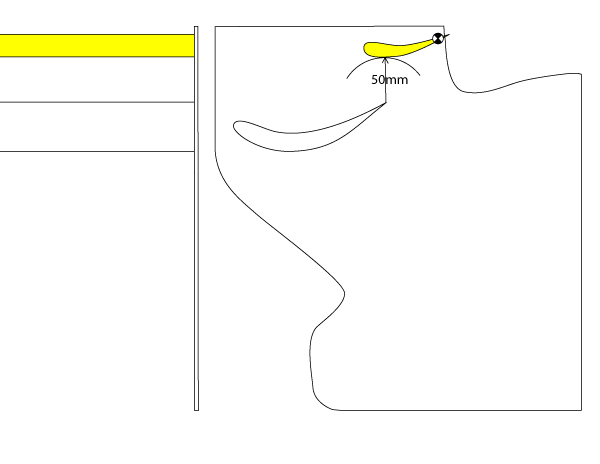 Secondly the slot created between the two rear wing elements must be between 10 and 50mm. Currently F1 rear wing flaps are only 10-20 degrees off vertical, to bring the angle of attack down to nearer horizontal will require a large change in AoA. 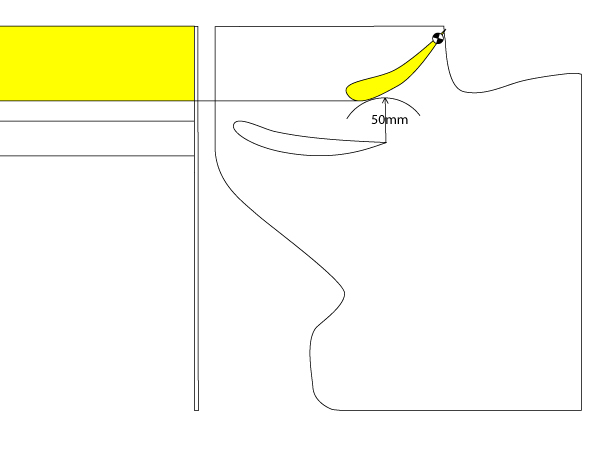 With only a 50mm opening, simple trigonometry will prove that to find the maximum reduction the angle of attack of the flap, will require a shorter flap. Although in its normal position, a smaller flap will not be as heavily loaded with downforce as a larger flap, the reduction in downforce\drag will be greater, due to the change in AoA. To demonstrate the effect I have drawn two wings, one with a large flap and one with a short flap. 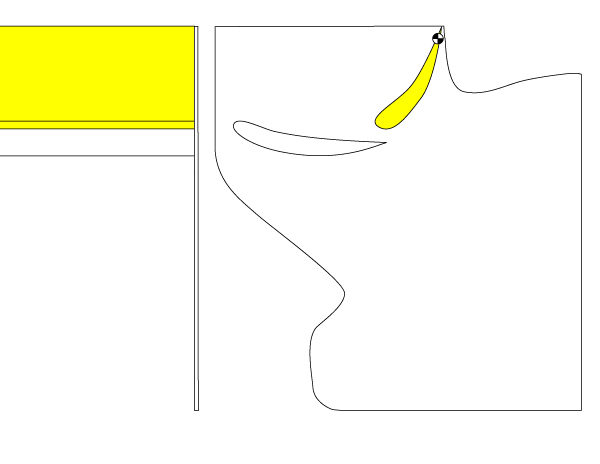 With the large flap in its closed position you can see a large area of wing exposed in the left of the illustration (shown yellow). 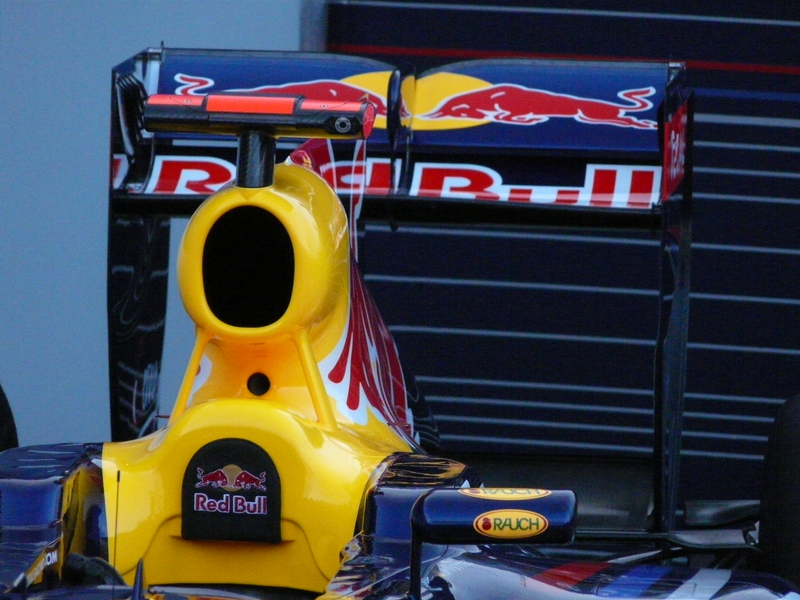 When DRS is activated and the wing opens to the maximum 50mm slot gap, the reduction in exposed wing area is noticeable. Now when we look at the short flap wing, the difference between open and closed is far more noticeable, as pretty much only the thickness of the wing profile is presented to the airflow. 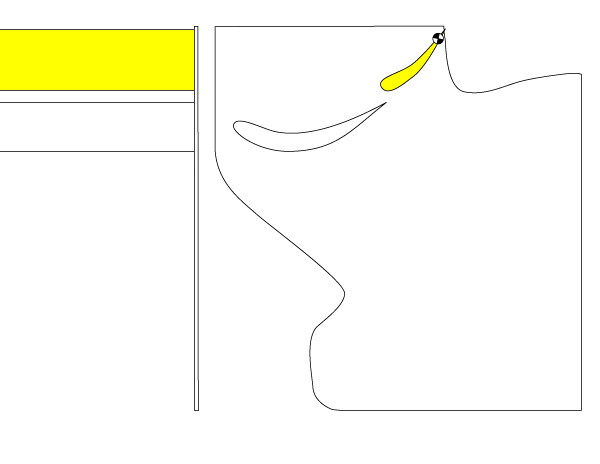 The challenge for the teams is produce a short flap wing, which still produces the level of downforce of the large flap wing. Also in creating this downforce, the wing must not stall or separate. As the reason for the slot in wings to reduce the airflow separating off the underside of the wing. Moving this slot rearward, by using a shorter flap, is likely to induce this sort of separation. Looking at DRS rear wing in use between different cars creates an optical illusion. Some wings appear to open far more than others. Red Bull and Mercedes are teams who have raced short flap DRS since the start of the season. When their DRS is activated, the slot gap appears much larger compared to McLaren who continue to race with a larger flap. Their flap appears to be only half as much as the other two teams. Although if we could measure it, all three wings are creating the same 50mm slot gap. This entry was posted in DRS - Adjustable Rear Wing, F1 2011 by scarbsf1. Bookmark the permalink. I think the way McLaren see it is that the aim of the device instead of providing best top speed is to provide the biggest differential in downforce. Like what they did as the season went on with the F-Duct last year theyre trying to make up for their car’s lack of total downforce by having as much rear wing as they can get away with. The aim of their DRS is then to negate it as much as possible on the straights where theyre generally strong anyway with the Mercedes engine. Instead of trying to get as much downforce as possible from a small flap they want to drop as much drag as they can from a much bigger element hopefully bringing them closer to Red Bull’s downforce level through cornering without giving up too much in a straight line. During the last F1 broadcast here in the States, someone mentioned that many of the teams were now designing the rear wings to always be on the edge of stall, even without the flap being open. This is presumably because of the diffuser / blown diffuser efficiency improvements. Perhaps this even has something to do with the amount of overtaking, and why it seems to have gotten easier in the last few races (i.e. they figured out the optimal wing / diffuser setup allowing for maximum straight line speed when the flap is open). So, what will happen if they clamp down on the engine mapping? How would this affect the rear wing overall design? Would we be back to the beginning of the season with less passing? Is there a minimum size of the upper flap? Good analysis, website is a great read!